Ballpoint pens are everywhere! People keep them in their purse, book bags, cars, desks, offices and in classrooms. They are both, affordable and portable. Whenever you need to write something down, a ballpoint pen can usually be found somewhere close by. We pick them up and carry them around without even realizing we have them. The reliability of the ballpoint pen is something most take for granted. With such a convenient writing tool, it is easy to see why its invention has had a major impact on literacy and education. Some may question the necessity of the ballpoint pen in today’s society, where one has access to computers, tablets and smartphones. However, even with the invention of these new technologies, the ballpoint pen still has a place in homes, offices, businesses and classrooms around the world. The ballpoint pen has a long history. Goad (2012) gives a brief summary of how Hungarian born, Ladislas Biro first invented the ballpoint pen. Biro was an editor of a paper and was frustrated with the fountain pen. He constantly had to dip his fountain pen in ink and it took a very long time to dry. He noticed that newspaper ink dried instantly and decided to use this ink and create a better pen design. In 1931 he showcased his invention at the Budapest International Fair and patented his design. 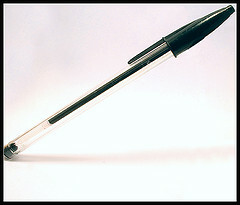 These first pens used gravity and would only work when holding the pen upright. Biro and his brother improved their design by developing a spring loaded piston in the pen. When the pen was pressed on, it would cause the ball to roll and transfer ink to the paper (Goad, 2012). Although the pen still had leaking issues, they worked great for pilots as they did not leak at high altitudes. The British government bought the rights to the “Biro” pen and used them in the Air Force (“The history of,”). Milton Reynolds saw the Biro pen and knew that it would be well received in America. He used a prototype of the Biro pen and used it to create his own version. He called the first American pen, the “Reynolds Rocket” and it sold for a very expensive $12.50 at Gimbels in 1945 (“101 gadgets that,”). It was Marcel Bich that finally brought the ballpoint pen into every day use. He solved the leakage problem and was able to lower costs. Bich paid Ladislas Biro a royalty on his patent and manufactured his own pen in France in 1952, which he called the “Ballpoint Bic” (“Ballpoint pens,” 2006). These pens were cheap to make, disposable and could be mass produced. The demand for ballpoint pens finally took off. In 1965, the french government approved them in schools, with other countries soon following suit (Smith, 2008). The fact that pens would be simply discarded when one finished with them, seemed unheard of up to this point. However, it is because of this that writing began to change. In classrooms, the ballpoint pen made writing quicker and easier. Students could write down lecture notes effortlessly, without having to dip their pen in ink. They did not have to worry about ink smudging their paper and could continue to place pages on top of one another while writing, without having to wait for the ink to dry. The ballpoint pen could be found in a variety of places that a fountain pen and ink could not. Writing became more portable. Individuals could write down their thoughts wherever and whenever they wanted to, as ballpoint pens were easy to carry and could be found virtually anywhere. There was no longer a need for people to worry about forgetting important information or ideas. They could simply pick up a ballpoint pen from a desk, car, pocket or purse and instantly write down whatever information they needed. We now live in an age where a smartphone is the new portable device that is carried around by individuals. It can be used to type important information, send pictures instantly and communicate ideas with others. However, the significance of the ballpoint pen to literacy and education remains significant. It was the ballpoint pen that created the idea that you can write anytime and anywhere. Even with the use of smartphones, ballpoint pens can still be found in just about every place. In fact, The Promotional Products Association International (PPAI) recently completed a survey on pen use. It found that 73% of people still carry writing instruments with them and that 83% use ballpoint pens daily (Keyser, 2012). Businesses are handing out these inexpensive pens as a great form of advertising. Their logos can be seen every time an individual picks one up. Apparently, businesses have allowed the luxury that the Federal Teacher (1950) was so sure wouldn’t happen. Mariana, Biro’s daughter believes that despite some critics that say the ballpoint pen ruined handwriting skills, it was her father’s greatest invention and legacy. Mariano remembers hearing her father respond to those critics with, “Well, writing comes from the heart. If we can help the hand to perform the task, what is wrong with that?” (Smith, 2008) There are now many other instruments that can be used to record information. However, often even when we are sitting in front of a computer screen, we still use our handy ballpoint pen to jot down notes. When we receive a phone call and need to take down a message, it is not our smartphone we use, but the pen resting on the table. With the ballpoint pen, we don’t have to depend on batteries or have to charge them. If a ballpoint pen runs out of ink, we merely pick up another one. Therefore, the ballpoint pen is still a valuable writing tool that can be used to record our “writings from the heart”. This entry was posted in Research Paper and tagged ballpoint pen, education, invention, literacy, pen, research, technology, writing. Bookmark the permalink. Nice work Anne,I did my paper on both pen and paper, however as you will see there isn’t much overlap at all, as I focused more on paper, and also took a wider historical perspective.